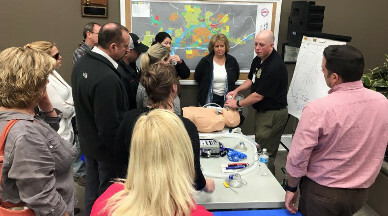 The clinical educators at LIFE FORCE Air Medical are responsible for providing educational opportunities not just for LIFE FORCE crew members,but for healthcare providers and first responders within the communities we serve. All of our educators have earned multiple instructor certifications and have many years of teaching experience. The majority of the education opportunities offered by LIFE FORCE enable attendees to earn continuing education. We teach hundreds of classes throughout the year from landing zone training and scene safety, to PHTLS certification classes. To view a list of upcoming education opportunities, see the events calendar. Want to receive education updates in your inbox? Click here to join our email list. To request an educational event be hosted at your facility, please complete the education event request form.